People who have TMJ--a disorder that is characterized by pain and clicking or cracking noises in your jaw when you chew, yawn and talk--often unwittingly grind their teeth at night. 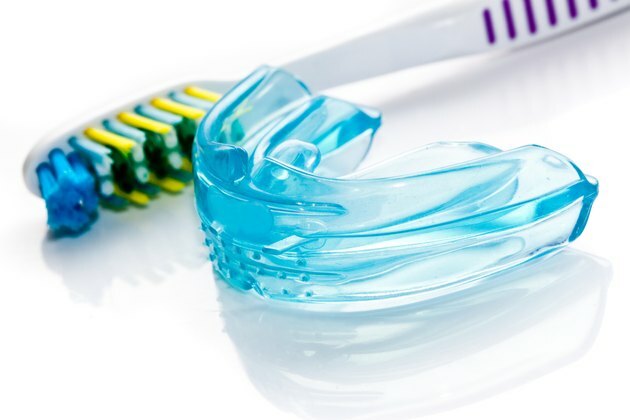 To prevent the tooth-grinding and the pain, wear a mouth guard at night. The guard is usually worn on the upper teeth, and creates a barrier that prevents them from meeting the lower teeth. You can't grind teeth that don't touch. If you have minor TMJ symptoms, use ready-made mouth guard, available at most sporting goods stores. These mouth guard are made of plastic that becomes pliable when heated. Boil the mouth guard according to the package directions and put it in your mouth while still warm. Your teeth will make an impression in the plastic so you can comfortably wear it. How Can I Make My Teeth Straight Without Braces?